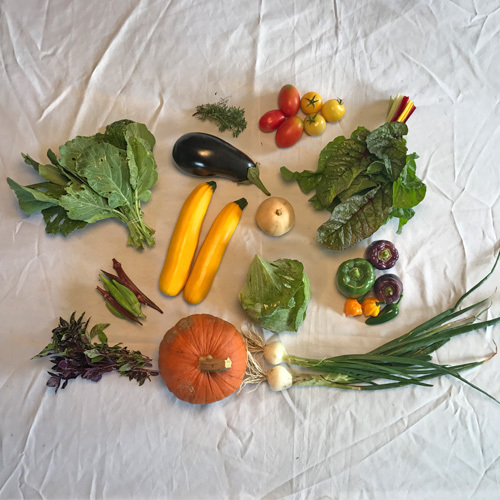 This weeks share includes dense vegetables that make nice hardy food as the weather starts to turn early this year. These meals are sure to warm the body and soul. The weather and pumpkin in this weeks share are a sign that fall is here early. I highly recommend the soup recipe, it is perfect for these cool evenings. Soften pumpkin in microwave for 2 minutes. Remove the top by slicing a 4" hole around the stem at a 45 degree angle. Scoop out seeds and fiber. In a seperate bowl mix 1 clove of garlic, diced, 1 small white onion, diced, 1/2 cup of chicken stock, 1 apple, diced, 1/2 tsp of salt, 1 tsp of finely diced winter savory, 1 tbsp of butter, and 1/2 cup of heavy cream. Coat the exterior of the pumpkin in vegetable oil, then place in a baking dish with high sidewalls. Pour mixture into hollow pumpkin and place top back on pumpkin. Cook for 1.25 hours, then remove the top and cook for another 20 minutes. 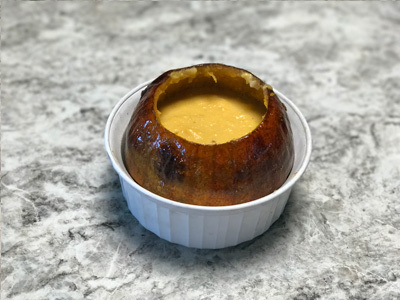 Gently scoop the contents of the pumpkin, including the flesh on the sidewalls, into a blender and blend until smooth, then pour mixture back into pumpkin. Or gently use an imersion blender inside the pumpkin and blend until smooth. Microwave buffy squash (petite white squash) for 1 minute. Peel squash, then cut in half and remove seeds and the fibrous core. Dice squash. Dice Swiss chard stems and cut the leaves into 1/2 inch ribbons. In a large saute pan heat 2 tbsp of olive oil over medium heat and add 1 small diced white onion. Cook until onion is translucent, then add diced buffy squash and Swiss chard stems. cook for 5-10 minutes, or until squash is tender. Add Swiss chard ribbons in handfuls, continually adding as greens wilt down. Add 1/2 cup of water, 1/2 tsp of salt, and cook greens until they are tender. Serve with a dash of vinegar or red pepper flakes if desired. 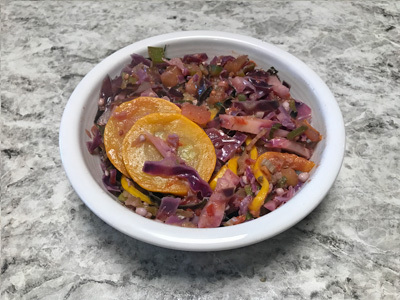 Slice summer squash, eggplant, and roma tomatoes into 1/4th inch coins. Finely dice 1 green pepper, 1 small onion, and 1 clove of garlic. 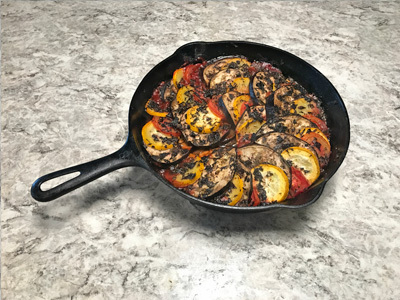 Add pepper, onion, and garlic to a cast iron skillet with a tbsp of olive oil. Sautee pepper for 3 to 5 minuets. Add a half jar of tomato sauce let simmer another two minuets. Remove from heat and add sliced vegetables alternating in a circle. top with 1/2 bunch of chopped basil, 1/4 bunch chopped summer savory. salt, pepper, dress with olive oil. Cover with aluminum foil bake for 45 minuets. Remove foil and bake an additional 15 minuets. Finely dice 1 small white onion and 1 sweet apple. In a large skillet saute 2-4 strips of bacon, then remove bacon and all but 2 tbsp of bacon grease. Over medium heat, saute diced onion and apple until onion is translucent. 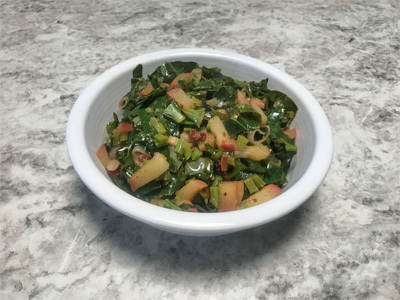 Chop collard greens into 1/2 inch ribbons, and very finely chop the leaf stems into 1/8th inch pieces (optional, otherwise discard). Add chopped greens to the skillet with 1/4 cup of water. Allow greens to simmer for 15 to 20 minutes, or until water has evaporated. Roughly chop 2-4 strips of cooked bacon and add back to skillet. Add 2 tbsp of apple cider vinegar, 1/2 tsp of salt, and toss to combine. Heat 2 tbsp of olive oil over medium high heat. Add 1 small diced white onion. Cook until onion is translucent. Add 1 head of finely sliced cabbage, 1 bunch of very finely sliced okra, 2 diced purple peppers, 1 finely diced jalapeno pepepr, and 3 diced yellow cocktail tomatoes. Cook for 10-15 minutes, or until cabbage becomes tender. If pan becomes dry add 1/4 cup of water or chicken stock. 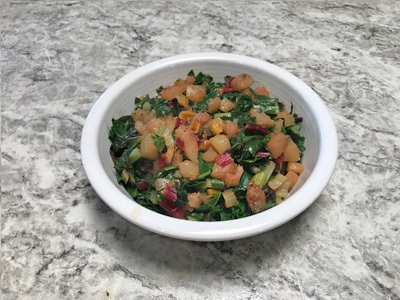 Add summer squash, chopped into 1/4th inch disks, 1/2 bunch of opal basil, about 1/4 cup finely chopped, 1/4th bunch of winter savory, finely chopped, and 12 tsp of salt. Cook, covered, for another 10 minutes.